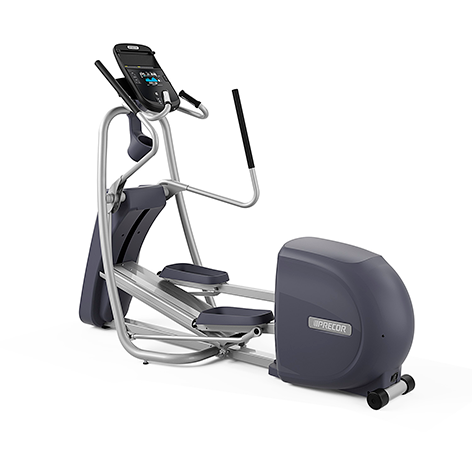 The EFX 425 is the mid range elliptical crosstrainer in Precor’s Precision Series. It is similar to the base model in terms of build quality and design, but has movable handlebars instead of stationary ones for full body workouts. Residential Precor ellipticals are built strong and durable, just like their gym counterparts. The EFX 425 features CrossRamp technology that gives you up to 40 degrees of incline and a blue-white high contrast LCD display that shows you resistance level, time, calories, distance, strides per minute, heart rate, SmartRate zone and other relevant metrics. UPDATE: As of 2017 the EFX 425 is no longer being sold. You can see all of the latest Precor elliptical trainers here. Although the Precor ellipticals are quite expensive, reviews from users and fitness experts alike are very positive so most agree they are worth the price. Assembling the EFX 425 will take you a couple of hours and you'll need an extra pair of hands to assist you with the process. Once set up, the machine is rock solid. The base levelers make sure the machine stays stable even when you raise the ramp to the highest incline level. A word to the wise – the machine is heavy. So, do not plan on moving it around and make sure you allocate a permanent space in your living room. The CrossRamp has an elevation range of 15° - 40° with 20 incline levels. This really allows you to vary your workouts and target different muscle groups effectively. You can raise the ramp to increase the intensity of your workout and burn more calories than you normally do. You can also adjust the angle of the ramp in small increments to target specific muscle groups like glutes, quads, and calves. One of the best aspects of the EFX 425 is that it maintains a natural elliptical motion even at an incline of 40°. There is no unnecessary strain on your joints and you do not feel numb or sore even after a strenuous workout. This is one of the reasons why Precor ellipticals are rated highly by users and critics alike. The EFX 425 has movable handlebars – a much-needed upgrade from the fixed handles available on the EFX 423. With movable handles, you have the freedom to work your upper body muscles and get a full body workout rather than limiting yourself to the lower body. The electromagnetic eddy current resistance system is super smooth and silent. You can use the dome keys on the console to change the resistance level any time you want. The EFX 425 comes with Precor’s standard safety features – a locking pin to ensure the foot pedals do not move when the machine is not in use and the option to lock the console using a safety code. The SmartRate technology tracks your heart rate using the hand sensors and the chest strap transmitter and tells you what zone you are in – warm up, cardio, fat burn, or high. So, what does the machine lack? Some users have mentioned that a touchscreen display would have been a better choice for the machine rather than the standard LCD display. The lack of Preva workout tracking technology (found on the step up EFX 447 model) also seems to have surprised many users, as it is something you expect to see in a high-end machine like the 425. The EFX 425 is yet another high quality product from Precor. It is truly a gym-quality machine and second to none in terms of design, build, and the quality of components. The combination of CrossRamp and SmartRate technology can help you get a fitness club like workout without stepping out of your living room. Like all Precor machines, the 425 is durable and comes with a generous warranty. Also, the machine is built to light-commercial standards and is capable of withstanding heavy use on a daily basis. The lack of workout tracking technology could be a point of concern for some of you, in which case you can opt for the EFX 447 – the most advanced machine in the series. If it is out of your reach, you can also take a look at the EFX 245, which is the top-of-the-line machine in the Energy Series.